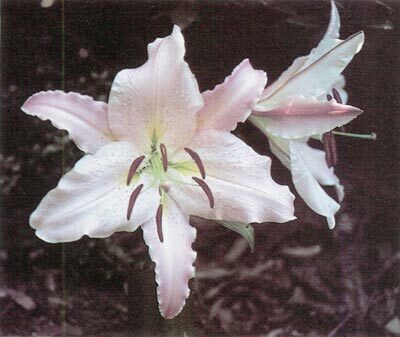 Felice Blake and her husband hybridize and grow many types of lilies as companions to their rhododendrons. 'Stella Crozier', one of their prize winning pink orientals, is now being tested in Holland and Australia for the cut flower market. Amidst the plethora of companions for our rhododendrons, surely the beautiful Lilium must stand pre-eminent! It always is an enigma to me that lilies as companions are not promoted by the lily societies, and conversely why our rhododendron societies do not promote rhododendrons as companions for lilies! In the context of this article I am referring to the true Lilium , not other genera masquerading under the loose title of "lily". In our garden, lilies are in flower for just over five months of the year. As the majority revel in the same conditions as rhododendrons, lilies take a most important role in our overall garden planning. Species, asiatics, trumpets and orientals all play their part. However, surely the most majestic and fascinating of all must be the orientals. This large and varied collection of lilies has evolved from various species, perhaps mainly L. auratum , speciosum and rubellum . The result is a tremendous variety of flowers ranging from the most delicate pinks to the most flamboyant glowing reds, not forgetting the pristine beauty of the pure whites. Although our lily season begins in spring at the height of the rhododendron season (late October/early November here) and lasts until autumn (early April), the main period for orientals comes in January and February. 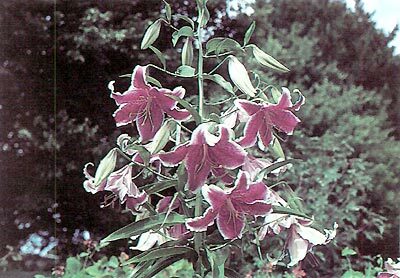 We have been growing orientals and, more importantly, hybridizing them for a number of years. Each year we make a number of crosses, so each year we can eagerly look forward to a new batch flowering. This can, of course, be the cause of much anticipation and, can I say, excitement. To me the first flowering of one's own hybrid lilies, or rhododendrons for that matter, provided they are of some merit, must surely be one of the satisfying of all aspects of gardening. However, it was not until we injected the "blood" of L. rubellum to our orientals that we began to achieve our real desire, pure delicate pinks, quite unlike the orientals of a few years ago. Our pinks are the earliest of our orientals to flower, followed by the white ones with golden bands down the centres of the petals, more after the style of the "golden rayed lily of Japan". I think these days we do see far many more hybrids than the true species L. auratum . The bright and dark reds follow a little later. Now, why can these be considered such good companions for our rhododendrons? To begin with they associate happily together. The lilies seem to take over the role of garden leaders as the rhododendrons relinquish it for the season. Lilies take the back seat and do not make themselves obtrusive until the glory of the rhododendrons has passed, but the emerging shoots are eloquent in their silent promise! Most of us like to have a garden with year round interest, and lilies make a big contribution to the summer scene — actually we now find that we have as many visitors to our garden in the lily season as we do in the rhododendron season. For those gardeners who have not indulged in lily growing, it is suggested that it is imperative that they obtain lilies from a reliable source. Lilies, like many other garden plants, can be subject to various diseases, so one must begin with healthy bulbs, so be warned! Some gardeners, quite wisely, grow all their lilies from seed, thus ensuring a healthy stock right from the beginning. This simple precaution will not guarantee that one's lilies will never be attacked by some virus or fungus, but will simply lessen the risk. But I must not be off-putting, merely sounding a word of caution. Over all the years we have been growing lilies, our problems have been minimal, no more than our problems with rhododendrons. We like to plant our lilies informally in say, groups of three to five, among our rhododendrons wherever there is a little room. Our orientals are planted among our bigger rhododendrons and deciduous azaleas, but not as a foreground, we usually have some room in between the rhododendrons or at least behind them. Remember that orientals are stem rooting and should be planted about eight inches deep, so that there is about five or six inches above the bulb for the development of the stem roots. Remember too that the flowers take up quite a lot of room, so do not plant the bulbs too closely. From well established bulbs you can expect stems from five to eight feet high bearing twenty-five magnificent flowers or more. We always put a good dollop of bone meal (or complete fertilizer) under the bulbs, not actually touching the bulb, of course. Lilies need plenty of food (they will reward you). When feeding your rhododendrons, remember to feed your lilies too. The soil needs to be loose and friable, with compost or leaf mould worked into it, as one would prepare for rhododendrons. Opinions differ as to the advisability of resting the bulbs on some coarse river sand - we do, as in our soil there is no risk of this forming a wet sump, and we think it does assist in preventing basal rot. Lilies must have a well drained soil, as with rhododendrons. Orientals are easily grown from seed. We use a loose mix of river sand and peat, and a "smidge" of bone meal. We use pots or polystyrene boxes, and just cover the seed with the mix. The orientals have what is called hypogeal germination, that is a tiny bulb is formed underground, but the first leaf does not usually appear until the following season. The bulbs will flower generally in the fourth year, occasionally in three years. If you have a variety that particularly appeals to you, it can be easily propagated from scales, taken in late summer or early autumn from the parent bulb, these will usually flower two years later. Lilies will also increase from little stem bulbs or by the natural division of large bulbs. In fact, given good conditions you will find that your lilies will need to be lifted and divided at least every three years. When your lilies first pierce the ground in spring, it is necessary to protect them from slugs and snails which consider them a delicacy, so too do aphids. It is of the greatest importance to protect the lilies from aphids, as these are the carriers of virus diseases which can be one of the greatest problems facing the lily grower. Keep a watchful eye for aphids in autumn too. Another problem that can occur if there is insufficient air movement around your lilies is the fungus, botrytis, which can be avoided or at least lessened with systemic fungicide at the first sign. But do not be deterred by these problems, they should not worry you to any great extent! 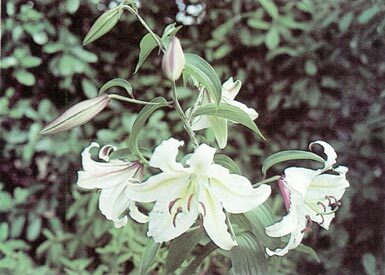 There are many fine nurseries in your country offering lilies. If you feel you would like to know more about this fascinating genus, I would suggest that you join the North American Lily Society which advertises in our Journal. This Society offers a quarterly bulletin, a year book, and very importantly a truly marvelous annual seed list. 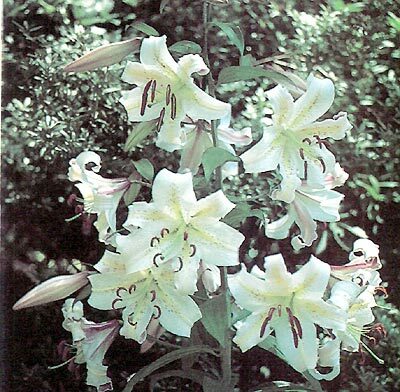 It should not take any gardener very long to become completely "hooked" on these most beautiful lilies as companions for their rhododendrons.